I have a confession to make. I am addicted to frozen desserts even in the winter. 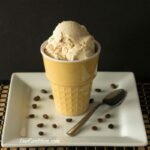 Even though the temperature has dropped to below zero this week in Connecticut, I’ve been enjoying homemade ice cream. To support my addiction, I recently upgraded from an old Cuisinart ICE-20 ice cream maker to a Cuisinart ICE-100 ice cream and gelato maker. The biggest problem with my old machine is that I had to make sure the gel in the canister was frozen before I could make homemade ice cream. 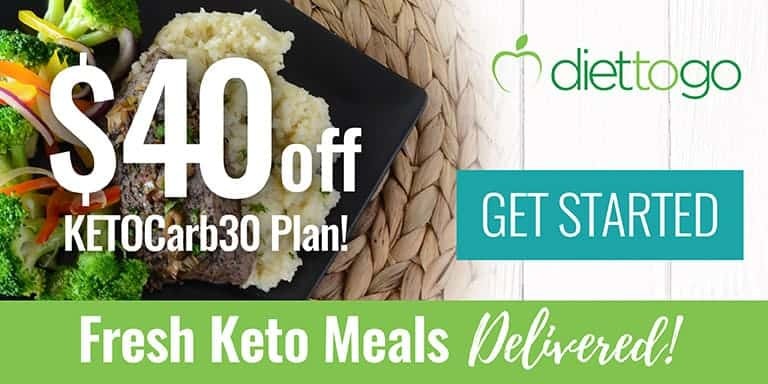 I don’t have the extra space in the freezer to store the canister. 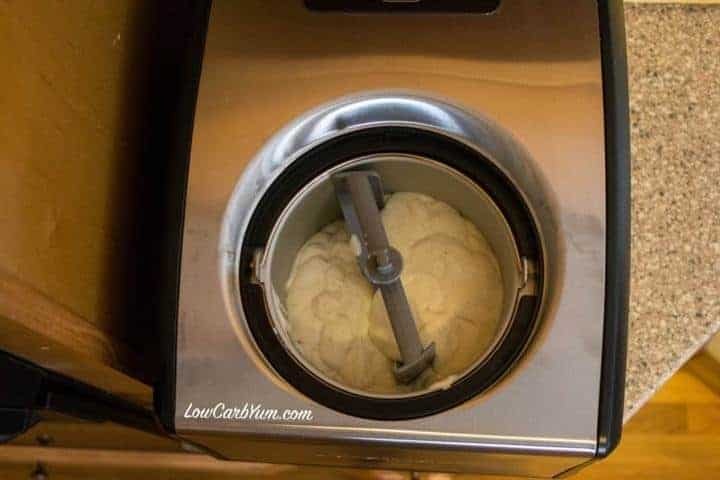 And sometimes I like to make a couple batches of my favorite sugar free ice cream recipe on the weekend so I wanted to upgrade to an ice cream maker with a built in compressor. 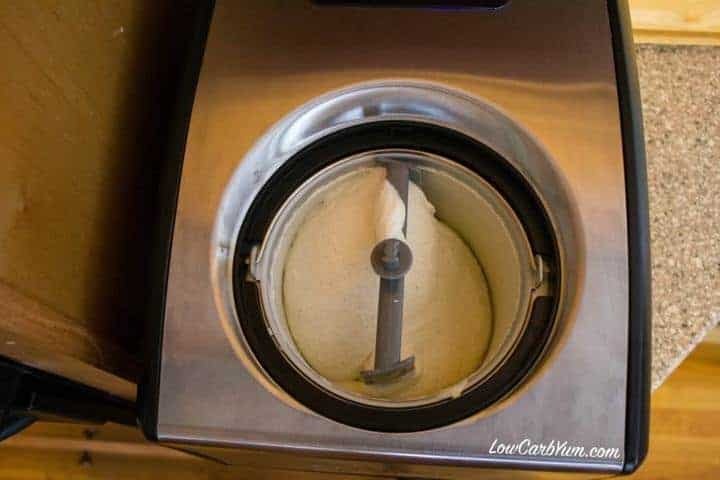 The other benefits of using an machine with it’s own cooling unit is that the temperature stays cold while processing and you can leave the ice cream in the unit for a while after it’s done without worry that it will melt. Now I can make my beloved ice cream on a whim without having to freeze the canister beforehand! 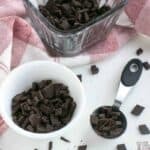 While reading the Amazon reviews for various ice cream makers, I discovered that many people were recommending using an ice cream making method developed by Jeni Bauer that supposedly results in very smooth and creamy ice cream. 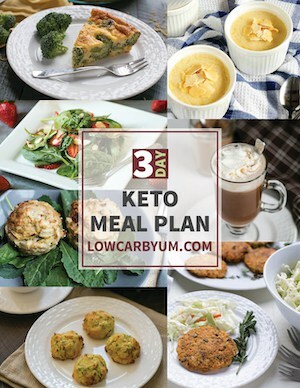 Before buying her ice cream making book, it was suggested to try some of her recipes available online first. 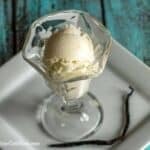 So, I did a quick Google search and found this recipe by Jeni Britton Bauer for Vanilla Bean Ice Cream. 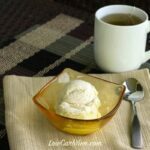 I adapted Jeni’s recipe to create this low carb vanilla bean sugar free ice cream recipe. 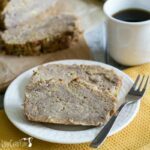 The original recipe calls for cornstarch as a thickening agent. 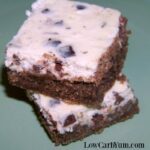 I added xanthan gum instead and added it right to the heated mixture. Jeni recommends boiling the milk/cream mixture for 4 minutes to denature the proteins. She also adds corn syrup which is high in glucose to bind the water together. I added a similar amount of VitaFiber syrup which is high in fiber, not glucose, but acts similar to corn syrup in other applications. 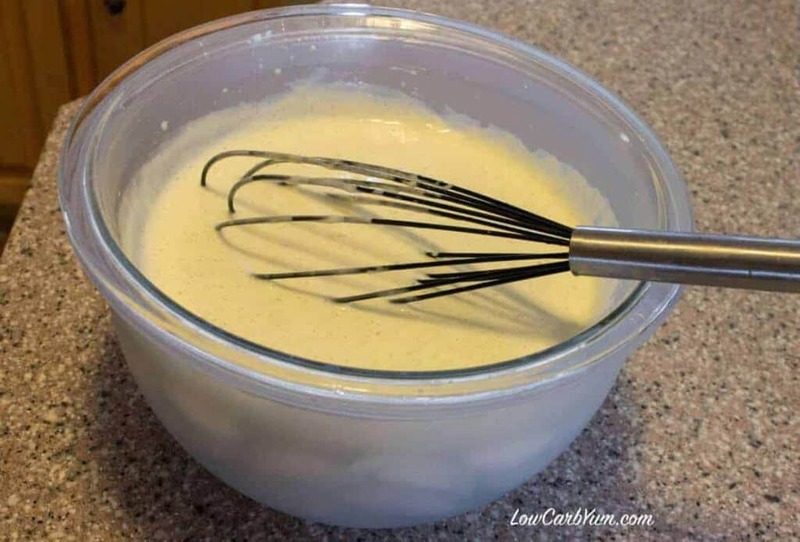 The cooked cream mixture is then slowly mixed into a small amount of softened cream cheese which enhances the taste and texture. The hot mixture is cooled down in a water bath for 20 minutes before processing in the machine. I just set a smaller bowl into a larger bowl filled with ice water. As its cooling, you need to stir it every few minutes to ensure a skin doesn’t form on the top. I found the mixture to be really thick. Perhaps I should cut back on the xanthan gum next time. I read that Jeni processes her ice cream as gelato so I used the gelato paddle of the ice cream maker. The regular ice cream paddle allows more air so using the gelato paddle should result in denser ice cream. 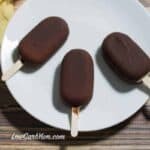 This was my first time making a sugar free ice cream recipe using a gelato paddle versus the regular ice cream paddle so I have nothing to compare to other than the fact that the result was similar in texture to a smooth gelato. After about 40 minutes of churning in the ice cream maker, the mixture looked similar to a very thick soft serve ice cream. It took some time to scrape the mix off the paddle with a slim rubber spatula. Then I transferred it to a Tovolo ice cream tub container specifically made for storing homemade ice cream. As directed in the original recipe, I covered the top of the homemade sugar free ice cream with plastic wrap so it froze without touching any air. 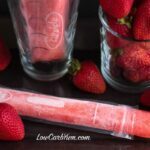 The sides of the Tovolo container are also insulated with air which prevents the ice cream from crystallizing so it will keep longer in the freezer. I really like this design and it makes it easy to glide a scoop along the top of the frozen ice cream. It took a while for the ice cream to fully freeze, more than four hours. Like most homemade ice creams, it froze pretty hard. However, after letting it sit out for 5-10 minutes, it was easy to scoop. 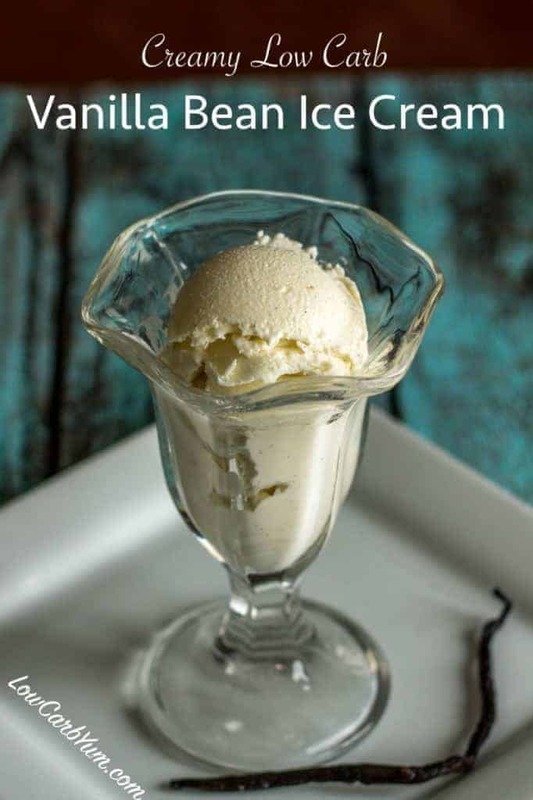 The taste and texture of this homemade sugar free vanilla ice cream recipe is fantastic. 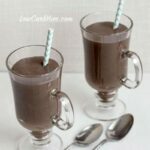 I have to say that this is the smoothest and creamiest that I have ever made with or without sugar. 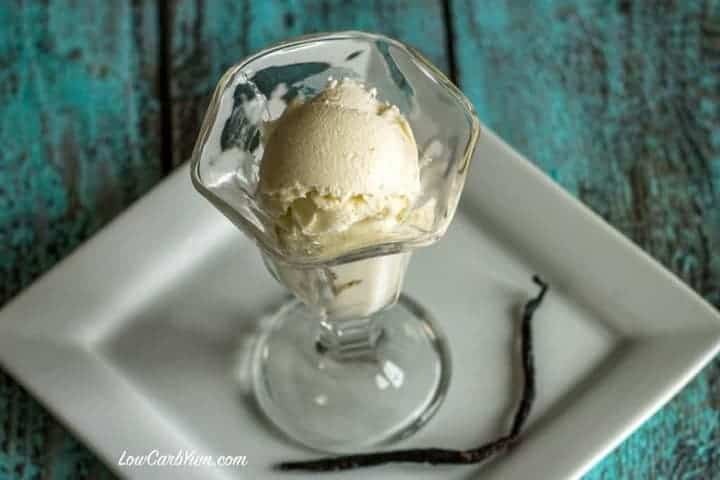 This homemade ice cream reminds me of the very expensive premium ice creams sold at the local seasonal shops in our area. I plan to buy Jeni’s Splendid Ice Creams at Home book so I can experiment more with her ice cream making method. 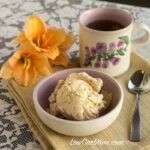 A homemade sugar free low carb vanilla ice cream recipe that results in a smooth and creamy texture. This sugar free ice cream tastes similar to premium brands. Fill a large bowl with ice water. 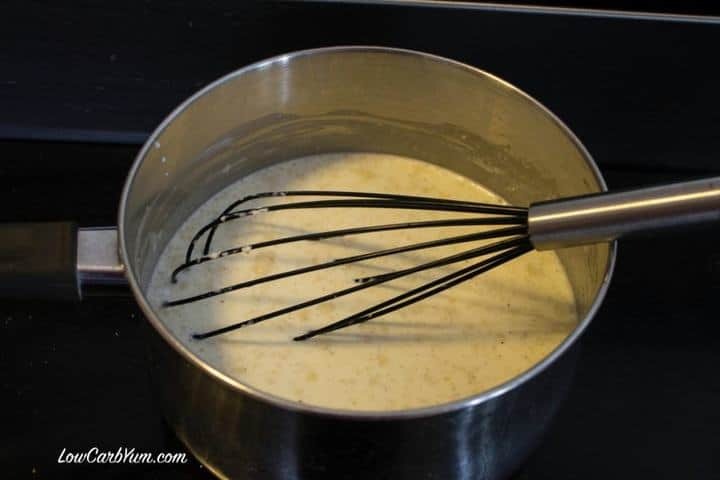 In another large bowl, whisk the cream cheese until smooth. 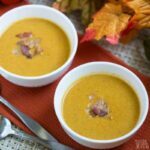 In a large saucepan, combine the almond milk, heavy cream, VitaFiber powder, stevia extract powder, VitaFiber syrup, and vanilla bean seeds. Bring the milk mixture to a boil and cook over moderate heat about 4 minutes. Stir in xanthan gum. Pour mixture into an ice cream maker and freeze according to the manufacturer's instructions. 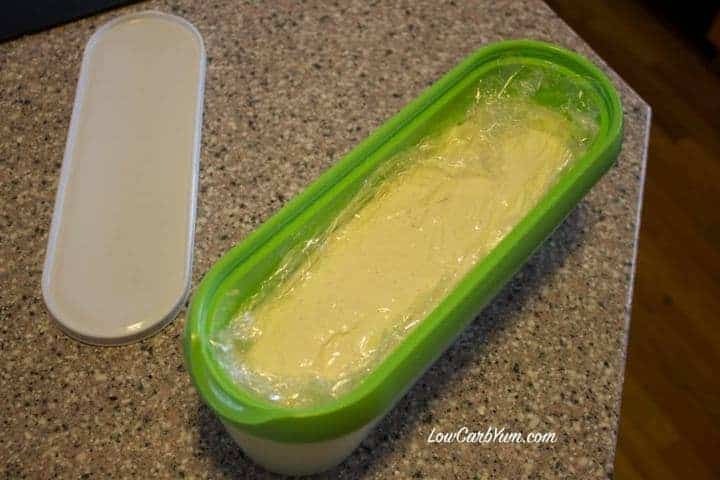 Pack the ice cream into a plastic container.